At the core of everything in communication is storytelling. Actually, it’s at the core of just about everything in general. The science world has been figuring this out slowly in recent years (read last fall’s distressing articles by Andrew Freedman and Jonas Lehrer) — even scientists with their supposedly perfectly objective brains turn out to be drawn to “a good story,” meaning a positive result. And tragically, even scientists who point out the tendency of other scientists to do this end up doing it themselves (I’m still trying to make peace with recent revelations of Stephen Jay Gould doing this with his landmark book, “The Mismeasure of Man” — I remember sitting in his lunch group listening to him tell his apparently-fudged stories of Morton’s skulls to us back in 1979). Now millions of people are suffering and dying in the Horn of Africa and because it’s not a good story (it’s been developing slowly), hardly anyone seems to be noticing or caring. That’s the message of this article in the NY Times today. It’s tragic. Welcome to the human race, where if you die a slow death hardly anyone notices, but if you’re lucky enough to be in a bus that sails over a cliff then you’ll probably make the front page of most newspapers. This dynamic has been at the core of our nearly ten-year-old Shifting Baselines Ocean Media Project. We threw all our effort behind the term “shifting baselines” (coined by fisheries biologist Daniel Pauly in 1995) because we continue to think it’s about the most important concept for the future. The way you go from paradise to oblivion without anyone getting motivated to do anything about it is through the slow and gradual shifting of reference points (= baselines) at a rate slow enough that hardly anyone notices. I wrote an OpEd about this in the LA Times in 2002 for which the editors gave it the subtitle, “Slo-motion disaster.” Which is EXACTLY the theme of the NY Times article today — it’s just all happening too slowly for anyone to care much. The bottom line is that we are a mess. The programming of our brains is a disaster. And in fact, we’re so stupid that anyone who writes a book about how, “We don’t make rational decisions,” can find an instant audience of people just endlessly fascinated by how irrational we are. Massive crowds of people saying, “Well, gol-lee, that’s just amazing, you mean we aren’t always logical? I can’t believe that!” We’re so dense. In the Nicholas Kristof Outside Magazine article that I love to cite repeatedly, he cites social psychologists who show that you might care about the plight of one child, but if I try to expand that to telling you about even just two children, you automatically care less. These are all basic storytelling dynamics. Over the past decade the word “narrative” has cropped up more and more in political discussions and analyses. People are figuring this stuff out. Storytelling (i.e. “the narrative”) lies at the core of everything. And some day universities will begin their curricula by requiring students to take as their very first course, “Practical Storytelling for Today’s World.” When this happens, the science students should be required to take it twice. 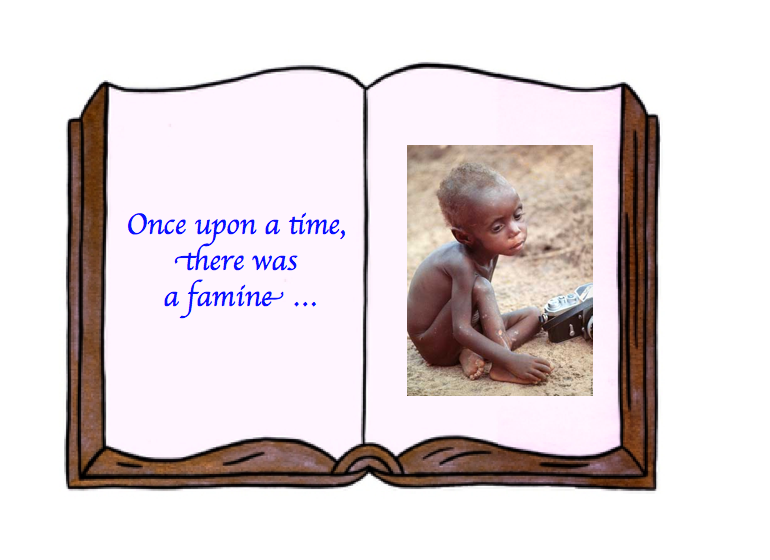 Also, in the meanwhile, Andy Revkin, who deserves an award as a “Climate Cop” for his tireless efforts in keeping the bar high for “proof of global warming” has an excellent piece today on his Dot Earth blog about the African famine. He points out that not only are we unable to say this current famine is caused by global warming, but even if a link does emerge, the amount of suffering going on is due much more to human behavior in the form of the Shabab Islamist insurgent group which controls much of southern Somalia and are preventing help workers from reaching the victims, than from what we’ve done to the climate.